The SAD tool is a research use only tool designed for sensitive aneuploidy detection using multiple low-coverage whole-genome-sequencing datasets. The tool is streamlined for very simple operation and the normalization process allows for detection of aneuploidies even with a high background of non-aneuploid data. 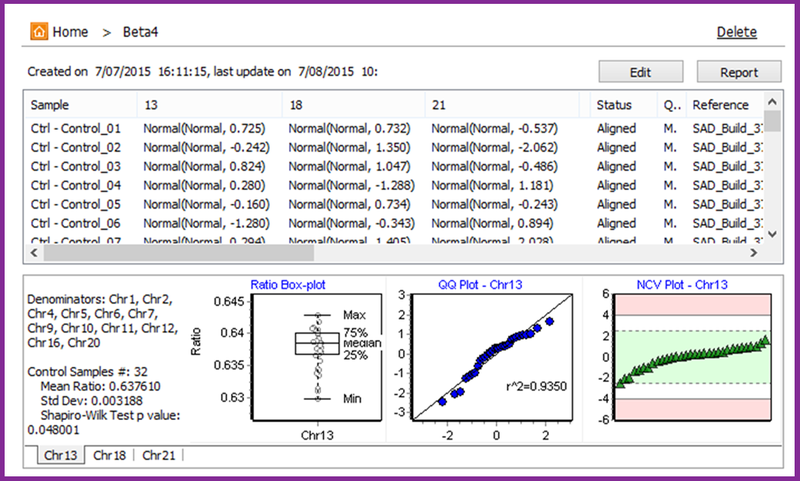 The tool accepts FASTQ files or BAM files and automatically aligns, counts reads, and performs GC correction. This process results in a call for each analyzed chromosome (figure 1) and statistics that are useful for quality control (figure 2). One possible application of this tool is for non-invasive prenatal testing (NIPT). This kind of testing has been used in several studies with data from Illumina (1,2), Ion Torrent (3), and Pac Bio (4) sequencers. This testing uses low-coverage whole-genome sequencing of maternal plasma samples to detect fetal aneuploidies. A set of at least 30 normal samples (“modeling controls”) is required to set up the analysis model which automatically accounts for biases in coverage across the chromosomes. The model is based on comparing “ratio” values for each tested chromosome to a normal distribution of these “ratio” values in the controls, resulting in normalized chromosome values (NCVs) similar to z-scores. Cutoffs are used to make calls based on the NCVs. The model can be tested for sensitivity and specificity using samples with known genotypes. Bianchi, Diana W., et al. “Genome-wide fetal aneuploidy detection by maternal plasma DNA sequencing.” Obstetrics & Gynecology 119.5 (2012): 890-901. Bianchi, Diana W., et al. “DNA sequencing versus standard prenatal aneuploidy screening.” New England Journal of Medicine 370.9 (2014): 799-808. Rava, Richard P., et al. “Circulating fetal cell-free DNA fractions differ in autosomal aneuploidies and monosomy X.” Clinical chemistry 60.1 (2014): 243-250.